Standard’s 15,000 square-foot National Demonstration and Training Center, located at the corporate headquarters in Andover, MA is equipped with a complete range of feeding and finishing solutions. 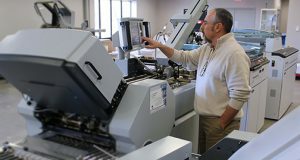 The Center is staffed by an on-site team of paper handling and post-press specialists who have decades of application expertise and can demonstrate the power and savings of intelligent automation. Visitors are encouraged to bring sample jobs so they can be evaluated to determine the most efficient feeding and finishing methods. Nearly every Standard solution is set-up and ready-to-run, including Horizon perfect binders, three-knife trimmers, floor-model folders, saddlestitchers, bookletmakers, die cutters, and slitters/creasers. This line-up is complemented by Standard Hunkeler unwinders, rewinders, rotary cutters, stackers, plow-folders, and dynamic perforators for continuous-feed digital printers. Highly integrated solutions – notably in-line saddlestitching and folding – are also showcased, to demonstrate high-speed finishing for production digital printers. 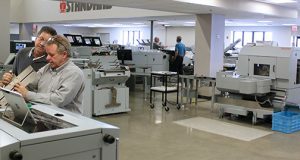 The state-of-art Center is also equipped with seven dedicated service training classrooms so that Standard dealers, print partners, third-party service partners and customers can receive in-depth technical and operator’s training on Standard’s products. Classes are administered by our professional team of paper handling and post-press specialists. Learn intensive hands-on and troubleshooting skills specific to each product, and become fully-versed in day-to-day machine operation to ensure maximum productivity and up-time. Classes are supported with helpful documentation, including ongoing access to technical handbooks and service and parts manuals.